The world number two was not at his best but still survived the challenge of his American opponent at the ATP Tour Finals. RAFAEL NADAL OVERCAME the effects of a stomach bug and some rusty play to open his ATP Tour Finals account with victory on Sunday evening. The Spaniard took on an ever-improving Mardy Fish in the event’s first late-night match and needed almost three hours to beat his American opponent, eventually winning 6-2 3-6 7-6 (7-3). Nadal hadn’t played a competitive match since mid October but took advantage of a nervous-looking Fish to break serve in the opening game. He then dominated the baseline rallies, though his serve wasn’t as efficient as usual, to seal the first set with little difficulty after moving 4-2 ahead. A change of tactics for Fish at the start of the second set saw him apply more pressure to Nadal’s serve and he was immediately awarded with a break. He almost went 4-2 up, except for some excellent defensive play from Nadal, and nearly broke again before taking the set 6-3. A stunning forehand passing shot saw Nadal surge 2-0 in front in the decisive third set. However, the crowd had not reckoned on the American’s determination and he fought back to break and move 3-2 ahead. Nadal broke again and though Fish saved two match points in the tenth game, the match went to a tie break. However, for all his brilliant play in the second and third sets, Fish had no answer for Nadal during the final points of the contest, and the former number one was able to seal a hard-fought victory. 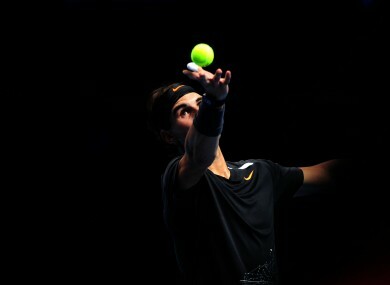 “It was a very important victory for me, for my confidence, to start the tournament with positive feelings,” Nadal said afterwards (See ATPworldtour.com). “I played a very good first set after the break from the beginning. “The second was hard. I made a big mistake at 0-1, 40/15 for me in the beginning of the second. That (gave him) a lot of confidence and after that, all the match was close. Next up for Nadal is a clash with long-time rival Roger Federer on Tuesday, with Fish taking on Jo-Wilfried Tsonga. Email “Nadal battles illness, Fish to win opening Finals match”. Feedback on “Nadal battles illness, Fish to win opening Finals match”.